So, you know when you've been using your rotary cutter and thinking that it's working great, but then try to remember when you last changed the blade and can't? But you think that it couldn't have been that long ago because hey, it's still cutting! Then you go ahead and change the blade and it's like cutting butter with a hot knife and you wonder why you don't change the blade with every new project. Then you remember the price of rotary cutter blades and that would be why they don't get replaced with every new project..
...but wouldn't it be nice if you could? Anyway, cutting, cutting and more cutting. That's what was on my agenda for today. I've finished up the blocks for the Ships and Stars and Pirate Arrghs quilt that i've been working on, so while trying to decide if i want to sash in white or yellow i thought i'd get some squaring up done on the Constellations HST's i have on the go. I love the Constellations line by Lizzy House and as soon as i saw it i knew i wanted to make new quilts for my two little guys. They share a room so i'm using all the same prints, 29 in all, but for Sammy's quilt i'm using Kona Steel for the grey and Max is getting Kona Iron. All of Max's 238 HST's have been sewn, cut and pressed and now i'm working on squaring up. Each one unfinished is four inches so i'm thinking i may need to either make more or border the quilt to get it up to the size that i want. We'll see once i get to the layout stage of the process what i feel like doing. ...i'm thinking by the time i finish with Sammy's i'll probably just want a break from HST's and end up bordering them both. 238 of the most repetitive high fives ever!! I'm linking up over at Freshly Pieced for WIP Wednesday... pop over and take a look around, you won't regret it. I leave you with three of my pirate blocks for my Ships and Stars and Pirate Arrghs quilt that hopefully i will have made a decision on and be able to sash tomorrow as well. All your blocks are fabulous. I love your fabric and colour choices. Thank you! The pirate blocks have been a long time in the making... one of those projects where everything just looks wrong and needs to be redone. So it's nice to have them finished and be happy with them! I have had the same conversation with my rotary cutter and totally relate. I love all of your quilts and blocks; they are always so sharp and comfortable looking!! Constellations is a line I love and think it is perfect for your boys' quilts!! Such an awesome mom working with all of those HST!! Thanks Gina, though i think the HST's might be the death of me. I love HST quilts but the mindless repetition i'm not so good at. I get bored easily, which is probably why i have 31 quilts on the go right now. Once i get them all squared up though it should be easy peasy! I just ordered some more pieces of Lizzy House Constellations--that lady's fabric just speaks to me! I think your boys' quilts will be wonderful. In a galaxy far far away (it seems like) I made two matching comforters for my little boys and they wore them out (they are now 38 and 36 years old), so when I saw your photo, it brought back great memories. And what fabulous pirate blocks! You really have a gift for putting things together, I'd say. Excellent. Thanks Elizabeth! I know, i just can't get enough of this line. 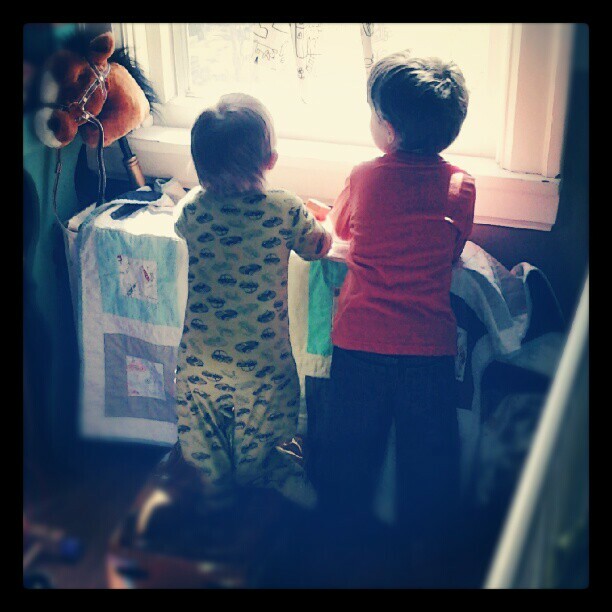 I'm wondering if it would be too much if i made curtains for their room with the Constellation print in teal? Hmmm, or maybe sheets and pillow cases? I may be getting carried away! I love the constellation line as well! Looks great with grey. I just finished a quilt top requiring 480 HST, which look great, but I am totally ready for a break! Love the pirate blocks! Wow, that is a lot of half square triangles! Might be worth a 4" square ruler purchase :) Your pirate blocks are adorable!